hermo-treated precious-metal conductors blended in proprietary ratios. Precious metal conductors in mas-sive bundles (which we have determined to be critical in a high- performance power cord), deployed on both hot and neutral sides of ground. A special geometry that must be formed by hand. Teflon- and air-insulated dielectrics with ultra-effective shielding. Thermo-treated precious-metal conductors blended in proprietary ratios. Precious metal conductors in mas-sive bundles (which we have determined to be critical in a high- performance power cord), deployed on both hot and neutral sides of ground. A special geometry that must be formed by hand. Teflon- and air-insulated dielectrics with ultra-effective shielding. Large vibra-tion-isolating tubing, supplemented with an external anti-resonant African hardwood block, to reduce struc-tural and airborne vibrations. Terminations using top-model Oyaide M1&F1 Supreme Power AC plugs. A unique end-shielding to block RFI. A good power cord is critical to lowering the noise floor. Achievement of goal is signified by reduced AC hum through the speakers, but more importantly by improved resolution and dynamic contrast on top of a relaxed and quiet background. 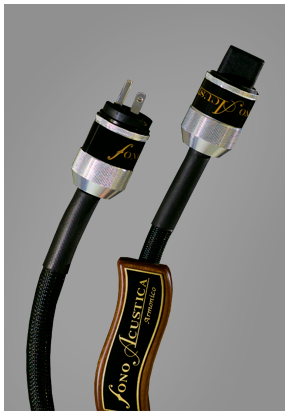 Through careful atten-tion to design and materials we have created a resol-ving, dynamic, and refined Power Cord that is faithful to source in realism, and faithful to listener in the commu-nication of musical emotion. You may discover (as we did) that with Armonico Power Cables you prefer direct wall power to your AC conditioner!